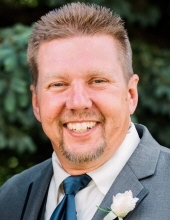 Michael W. Reszke, age 55 went to be with his Lord and Savior on Tuesday, October 23, 2018. Mike was a graduate of Pinconning High School and later graduated from Delta College. He worked servicing systems for Xerox and various other companies. In November of 1989 Mike married Cindy Kramer and that union was blessed with two daughters, Khai (Cody) Somerville and Kelsi Reszke, dog Rascal and grandpets Mika and Khaleesi. Also surviving are Mike’s parents, William and Anita Reszke, brothers Steve (Deb) Reszke (Gabrielle, Anthony, Madalene and Nolan), Doug Reszke and sister, Brenda (Dan) Schultz (Drew and Nathan Michael), his father-in-law, Ron Kramer, in-laws Kathy (John) Szewc (Jennifer and Kevin) and Paul Kramer (Zac, Alexa and Megan). Mike also leaves to cherish his memory many aunts, uncles, cousins and friends. Preceding him in death are his grandparents and his mother-in-law, Alvina Kramer. Mike enjoyed all things outdoors, be it boating, hiking, fishing, camping, or snowmobiling, but his proudest moments were completing repairs by hand around the house and cars. His favorite thing to do was spend time with his family. A Memorial Service to celebrate Mike’s life will take place at 1 p.m. Saturday October 27, 2018 from the Hopevale Church, 4873 N. Center Road in Saginaw. Pastor Matt Osborne will officiate. Mr. Reszke’s family will receive friends at the church on Saturday from 11 a.m. until the time of the Memorial Service. Instead of sending flowers, his family requests that those planning an expression of sympathy consider Hopevale Church or Camp Barakel. To plant a tree in memory of Michael W. Reszke, please visit our Tribute Store. "Email Address" would like to share the life celebration of Michael W. Reszke. Click on the "link" to go to share a favorite memory or leave a condolence message for the family.